What A Night. Guildford City were away to local rivals & fellow relegation battlers Fleet Town. My first visit to the ground, and I was stunned by the pitch lighting, 3200ISO, 1/160 @2.8 but only in the brightest parts of the pitch. City needed to win, but it looked like it was going to be a long night after Fleet Town scored very early on. 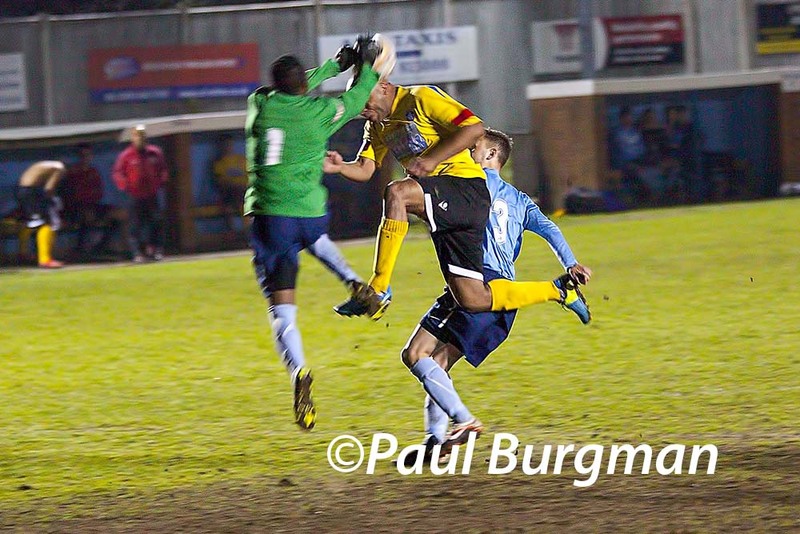 So one down with a couple of minutes played, until on seven minutes City’s LANCE BANTON-BROWN charged into the box, to be met by the Fleet Shot stopper feet first, with no intention of playing the ball. Decision was obvious, Penalty & Red Card, “early bath” for the Keeper. Looks like City are finally going to get some decisions going their way. After nearly 4 minutes of arguing with the referee, the Fleet Keeper eventually leaves the field. So with their goal scorer “between the sticks”, step up City Captain BEN WALSHE, always calm over the ball whether a free kick or a penalty, three steps, “back of the net”. Parity restored. On 13 minutes LANCE BANTON-BROWN has an effort on goal, but it is deflected and winds up at the feet of ANDY WHITE on the edge of the 18 box who smashes it in to the “back of the net”. Anyway enough of the football cliches, City ran out victors in what was a physical match with the referee seeming only to happy to join in and brandish as many cards as he could, and generally enjoyed the high spirited nature of the game. Jack Guilford (who plays for Guildford) netted a 3 for City, now it should have been a bit of a fun, training session football, but Fleet fought back with a goal from the penalty spot, after a hand ball in the penalty area. City should have been home & dry at the end of the first half, having missed a couple of chances & a couple of good saves from their stand-in keeper. Important thing: City Won, no point in crying over spilt milk, Lance Banton-Brown went off injured after a real clattering from the Fleet Keeper & a defender, hopefully he will be fit for tomorrows home game against Mangotsfield, who City lost to 5-3 first game of the season, due to being asleep for the first 3 minutes & conceding two goals.